A Montreal startup has become the first Quebec-based company to take advantage of the province’s new equity crowdfunding rules and it’s already surpassed its goal. Ubios, which is developing a modular smart home system, has raised over $113,000 from more than 100 investors since launching the campaign on Sunday. The money will be used to help Ubios bring a smart home system. “It’s now that the real work starts,” says Mathieu Lachaîne, the CEO and founder of Ubios. 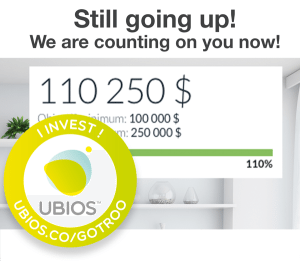 While his startup isn’t the first Montreal-based company to raise money through equity crowdfunding – where backers get a piece of the company they’re supporting instead of a “perk” – the Ubios campaign is the first one to allow the general public to invest. Previous equity crowdfunding rounds by other Quebec companies have been strictly limited to accredited investors, people who have a high net worth. Ubios, on the other hand, can accept investments from anyone who lives in Quebec, Nova Scotia, New Brunswick, Manitoba or British Columbia and is will to put up between $250 and $1,500. “It’s 100 per cent public,” says Lachaîne. Lachaîne says that for Ubios, equity crowdfunding opened the door to a level of funding that might not otherwise have been available. He says angel investors often want to play a role at companies they invest in, something the Ubios team wasn’t looking for. “We all have a lot of experience,” Lachaîne says. But at the same time, Ubios wasn’t quite ready for most VCs. The company is in the midst of a paid pilot project in Mont-Tremblant, a ski resort town an hour-and-a-half outside of Montreal. “The challenge that we have is getting that pilot done so that we can have delivery date,” Lachaîne says. That pilot is testing the first module for the Ubios device, which detects water leaks. Water leaks are a big opportunity, Lachaîne says they’re responsible for over half of all home insurance claims. The equity crowdfunding round is just one part of the $1.5 million the company is currently in the process of raising from a variety of sources including more established companies. Quebecor, the largest media and telecommunications company based in Quebec, and Bite Size Entertainment, a marketing agency that’s worked with companies ranging from Nike to Kleenex, have already invested in Ubios. Ubios has also started developing its second module, a smart thermostat. That comes with an additional challenge. Over 70 per cent of homes in Quebec, where heating often comes from radiators and baseboards, over 70 per cent of homes use high-voltage thermostats. Other smart home systems, like the Nest, only work with low-voltage. Still, while Ubios is starting in Montreal, it’s ambitions go beyond that. “We know that we don’t want this to become a Quebec-only technology, we’re looking to export it,” Lachaîne says.